The conservative-leaning website Breitbart News took some heat on Monday for a new ad campaign featuring a bizarre depiction of House Minority Leader Nancy Pelosi. The ad features an altered image of the California Democrat over the famous picture of Miley Cyrus "twerking" at MTV's Video Music Awards last year. 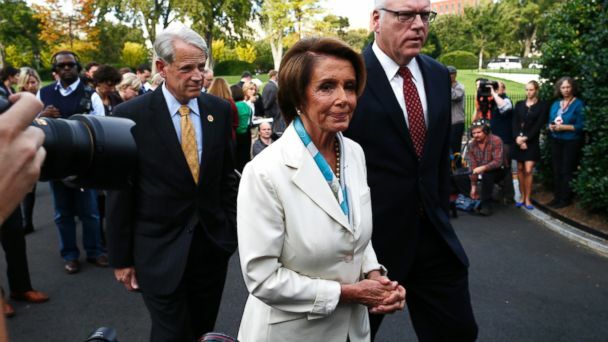 Above Pelosi is another picture of Calif. Gov. Jerry Brown, a Democrat, made to look like a bodybuilder. ABC News' John Parkinson asked Pelosi what she thought of the image. "It's so tasteless that I mean, is it even worthy of a question?" Pelosi said. "It's so undignified." Democratic National Committee Chair Debbie Wasserman Schultz also released a statement Monday condemning it. "To say the least, the Breitbart News ad is foul, offensive, and disrespectful to all women," Wasserman Schultz said. "It is a disgusting new low and would be reprehensible against any woman - regardless of party." The website shows the posters being put up all around California. They are part of a campaign to promote the launch of Breitbart California, a new wing of the website devoted to covering the state's news and politics. The push features other altered images, including Facebook founder Mark Zuckerberg with a female's body and TV personality Piers Morgan jumping a border. Just last week, Majority Whip Rep. Kevin McCarthy, R-Calif., praised the website's launch, saying it would fill a "void of conservative activism" that was left after the death of Breitbart founder Andrew Breitbart. "This weekend's launch of Breitbart California is a testament to his legacy of holding our public officials accountable for their actions," McCarthy said in a statement. "I look forward to the voice of reform-minded Californians being represented without bias as Breitbart California launches." But today, McCarthy was clearly miffed by the photoshopped images. "The images are inappropriate," Mike Long, McCarthy's spokesman, said. "We requested that Whip McCarthy's piece be taken down." Wasserman Schultz urged GOP leaders to "condemn this outrageous behavior, call on Breitbart News to immediately remove the ad, and not continue to use this website as a forum for their views." Breitbart News did not respond to an ABC News request for a comment.